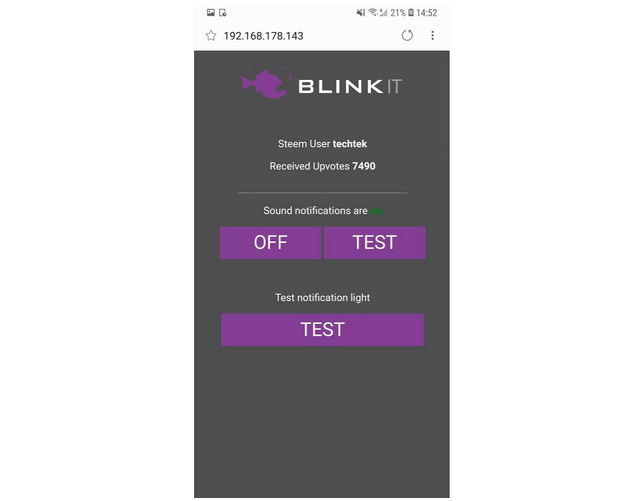 Blinkit | Standalone device v1.1 - Connect and control with your phone! 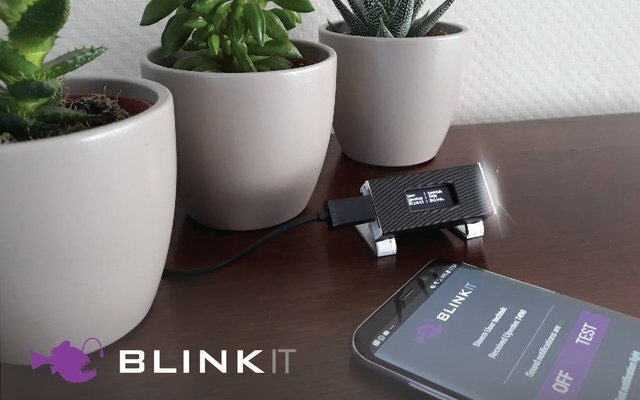 It is now possible to connect your mobile devices or PC to the Blinkit Standalone device, when connected it's possible to test the Upvote Blink actions: light and sound, and it's possible to turn ON / OFF the sound notification when newly received Upvotes are being received for the user. Don't want to be bothered by the sound of upvotes?! Turn it off with your phone. The device is up and running, for about a week now, there where not much moments where i would want to turn off the sound, it stands on my desk and not where i sleep, and its way to much fun to hear it beep happily on newly received upvotes, but for those moments when you do want to mute it, sound can now be turned off and back on with the use of a mobile device. Because most of the intended boards that could be made compatible, do not have convenient ways of changing and testing settings (there are not much onboard buttons, and no touchscreen) and it would therefore be very useful to make possible that a mobile device or PC can connect to the Blinkit Device, to use it for changing settings and testing it's features. 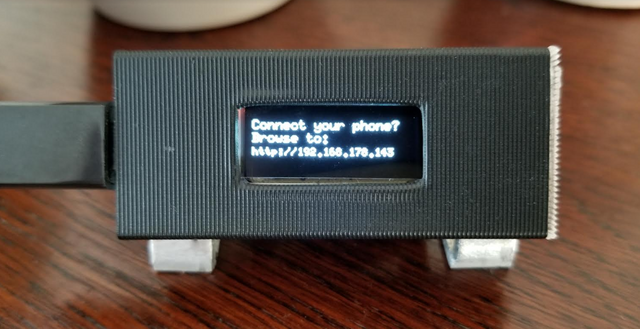 "Trigger urls", the above functions, presented in the web interface can be triggered by accessing there related urls, this can be used to control the device with simple requests, and used for example with IFTTT or Home automation products and services. Slimmed down the code, and made easy to read comments on the lines involved with this release, basically each is commented because multiple people will be looking into it and improving it / migrate to other boards and to add there work to it for this board. 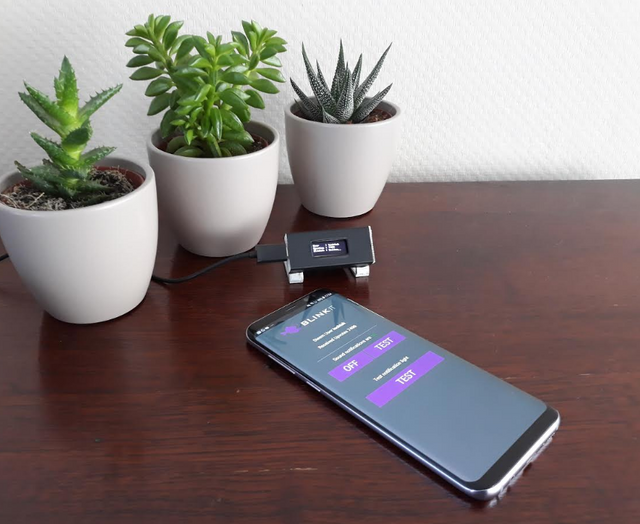 While the device boots, inform the user how to connect a mobile device. The following code is added to show the text and local ip on the device it's display. 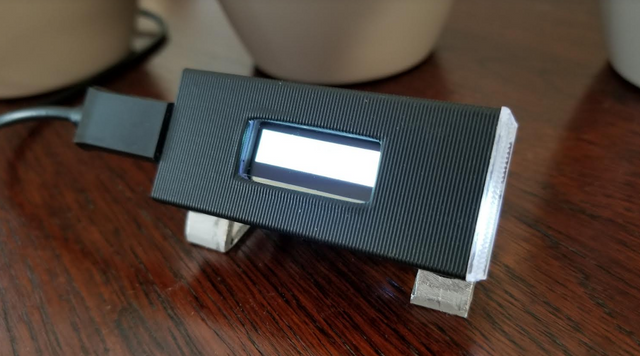 The device is now in development for around a week / and on for around a week is daily worked with and is kept on overnight, and it is working very well. Access the device by it's Hostname is not working yet, tested several approach, reset the WiFi router but not working, using the Hostname, instead of IP would be most useful / user friendly. Anyone have succes with Arduino ESP8266 and successfully setting up the hostname ? Beside opening the webinterface from a browser, a mobile app would be nice to have. Mobile app testing: To present the web interface full screen on a mobile device as a app, the Blinkit web interface/website is loaded into a Android "webview" class with this Android App, to test how it would function and behave, (the app makes it possible to turn a URL / website into a app with the webview class.) Test results: the web interface works very well, inside webview. And the idea is to soon make a dedicated mobile app for it, it would be most desirable if the Hostname would be available to work with, instead of making a mobile app where the url / ip would need to be typed in. Blinkit web interface inside a webview android app. Picture of the improved prototype when it detects a new upvote / when a new upvote is being triggered with the web interface. The Blinkit Github repository is updated. INO file that needs to be uploaded to the "Heltec Wifi Kit 8" board. The project can be found and funded on Fundition. and help to buy boards and parts for the team to test, do development work and helps to bring the best possible stand alone Blinkit device and Blinkit software to you and all Steem users. is any future update available on this device...means is any additional features will come on this device? Been long I checked about blinkit updated, been busy because of exams. Free now. 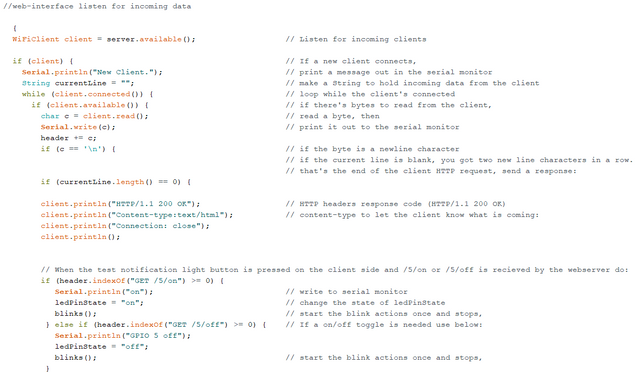 Have been really enjoying your work about blinkit, kudos @techtek but an idea came to my mind just now. Hi @Valchiz, How the exams went ? Thanks for your suggestion. a Android app with Blinkit functions is on the wish list as well, but first to develop is a Android app, that controls the Blinkit standalone device and it's features.